Bishop Done Peter Dabale, who leads the United Methodists in Nigeria, has returned to active status after being on leave of absence for several months. Dabale, 57, also has decided he will seek voluntary retirement as soon as a new bishop can be elected, said Bishop Peter Weaver, president of the United Methodist Council of Bishops. The West Africa Central Conference, which elects bishops for Nigeria and some other African countries, is planning a special election in March 2007. Bishops are the top clergy leaders of the nearly 11 million-member United Methodist Church. Dabale was placed on leave of absence last May by the council’s executive committee. The church in Nigeria was “conflicted” and had leadership issues to be worked out, Bishop Roy Sano, council executive secretary, said at the time. “They’re not issues of morality,” Weaver said. “...These are issues of administration and the way the conference operates.” The solutions included Dabale and others “being open to some new ways of operating.” And the issues aren’t all around one person, he added. Dabale came off leave at the Nigeria Annual Conference gathering in December, said Weaver, who attended the conference. The last three days of the Dec. 12-18 conference were held in Zing. Initially contacted for this story, Dabale said to call back later, but attempts to reach him again were unsuccessful. Also at the Zing gathering were Bishop Nkulu Ntanda Ntambo, who served as interim leader in the Nigeria Area, and Ethel Johnson of Columbus, Ohio, who worked on reconciliation and mediation in the conference during Dabale’s leave. 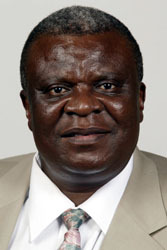 Ntambo is head of the denomination’s North Katanga Area in the Democratic Republic of Congo. Johnson is a retired professor who served at the Methodist Theological School of Ohio and Africa University, and went to Nigeria at the request of Dabale, the United Methodist Board of Global Ministries and the Council of Bishops. During December, Ntambo and Weaver visited three major sections of the conference and had retreats with lay people and clergy. “The spirit was good,” Weaver said. “There seemed to be a spirit of eagerness to move forward into the future and to have reconciliation where there has been some brokenness. “There’s been a lot of work done to identify some of the concerns and to address those concerns and to bring reconciliation,” he said. Ntambo and Johnson listened to people around the conference in seeking to understand and resolve the leadership issues. Ntambo divided his time between his own episcopal area and Nigeria, while Johnson was in Nigeria on a daily basis from June 24 to Dec. 18. One group of people was unhappy with Bishop Dabale and some of his actions, while other people felt he should not have been placed on leave. “Our task was to try to bring the two groups together,” Johnson said. She met with people in all 23 districts, heard their concerns and helped them think about how they could move forward together. Bishop Ntambo also brought people together by holding several retreats for pastors and laity. At the end of the six months, people were beginning to talk to one another, Johnson said. 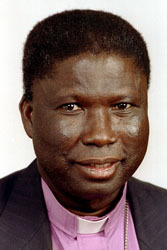 Dabale is the first and only bishop the United Methodist Church has had in Nigeria. 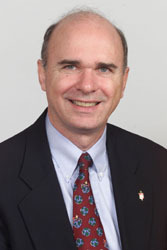 He was elected in 1992, after serving as general superintendent for four years, Johnson said. The church in Nigeria was a former Evangelical United Brethren conference, but internal problems prevented it from participating in the 1968 merger of the Methodist and EUB denominations. It wasn’t until 1984 that the Nigerian church asked to become part of the United Methodist denomination. 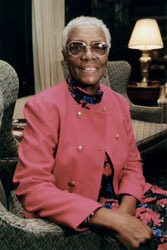 Johnson helped the Nigerian church organize into a United Methodist annual conference, spending six months in the country in 1985 and returning every year for almost 10 years afterward. The Nigerian church became a full annual conference in 1992. The United Methodist Church is “known as the most forward-thinking and forward-moving church in the country,” she said. The church works for all people, regardless of their faith, and provides ministries such as rural health, education and literacy programs. Until two years ago, the Nigeria Area had one annual conference, but the church has grown to such an extent that the West Africa Central Conference agreed to the formation of two provisional annual conferences in principle ? a preliminary step to getting full annual conference status from the denomination’s General Conference, which would give the area three conferences. Weaver expressed appreciation for Dabale, Ntambo, Johnson and others for their work in Nigeria. Other supporters included Bishop Gregory Palmer of Iowa, whose conference has had a close relationship with Nigeria for many years. *Tanton is managing editor for United Methodist News Service. "Hope for the Children of Africa"